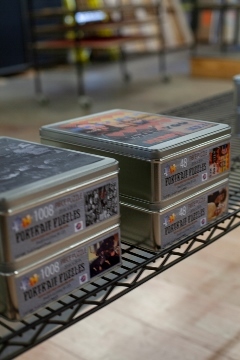 Portrait Puzzles is the leader in custom puzzles. We began selling custom jigsaw puzzles in 2005 and have been refining our processes and upgrading to new technology ever since. This ensures we are producing the best puzzles in the marketplace. 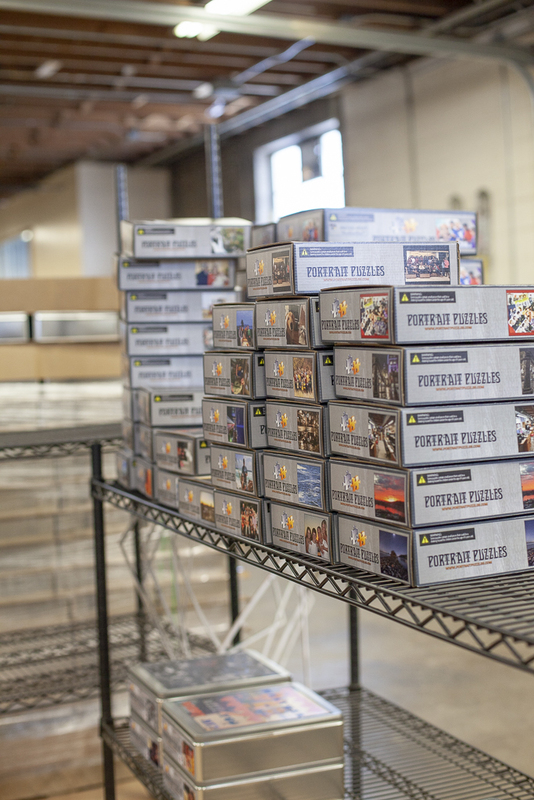 We are fanatical about providing the highest quality customized puzzles! Here is what it takes from start to finish -- using your photos to produce custom puzzles. Every photo is reviewed by our Photo Editor to ensure the resolution and quality meets the requirements needed to produce a sharp, clear image. Next we make sure the dimensions of your image fit the custom puzzle size you ordered. No matter if you ordered our 1000 piece puzzle or our postcard puzzles. We verify that your photo will make a perfect photo jigsaw puzzle! Now the image heads to the printer. 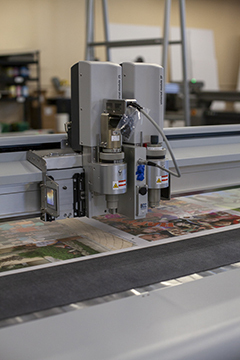 We print with large format, flat bed, inkjet printers. 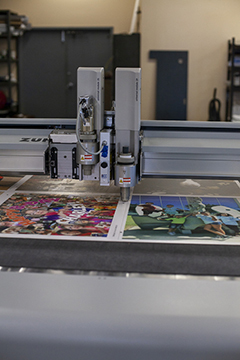 They can print up to 5’ x 10’ sheets! 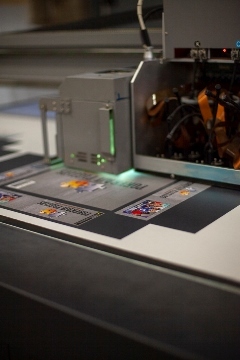 This technology allows us to print directly to high density puzzle board. 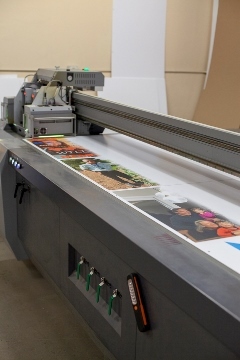 With our large printers we can print several puzzles on each board and several boards at once. Many puzzle makers print on thin paper then laminate this layer to the puzzle board. This can lead to this top layer peeling off when you put the puzzle together. This can't happen to a Portrait Puzzles custom puzzle! Put our puzzles together again and again. Your puzzle will have the same quality as it did the day we produced it! 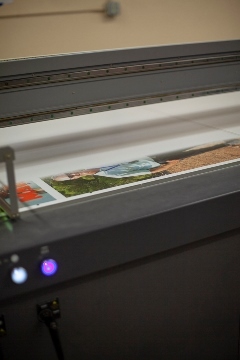 We inspect each printed board for quality. Then we place the board on the bed of our Zund cutter. 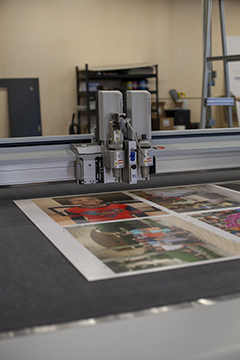 The cutter uses a camera to “see” your photo puzzle, then cuts around your image with accuracy of 0.01 mm! This gets your image ready for its transformation to a custom puzzle. The real magic of producing custom puzzles! Every different size of puzzle we make has a matching, hand made, steel rule die. For each cut line between the puzzle pieces there is a thin ribbon of sharp steel on the die. 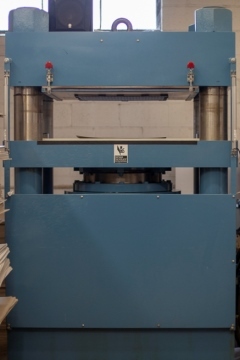 The dies can have several hundred inches of sharp knife-like steel! We mount the die for the custom puzzle size you ordered. 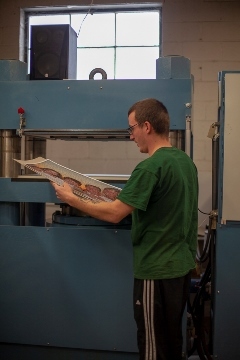 The printed board is placed in the press. 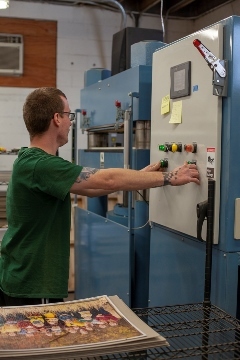 The press closes driving the die through the paper board. When the die lifts up your custom puzzle is ready for the final step! At this point the puzzles still all assembled. Who wants a puzzle they don’t have to put together? We give the puzzle one last inspection then break up it up by hand. It is the best way to make sure your pieces are all separated and ready for you to solve! The pieces are bagged. Finally we put them in either the custom box or tin that matches your custom puzzle. Custom Puzzles Start with You! Check out the custom puzzle sizes we offer. Upload a photo and it will be your photo that we are turning into a custom puzzle next!